News > Fiat Panda makes history! 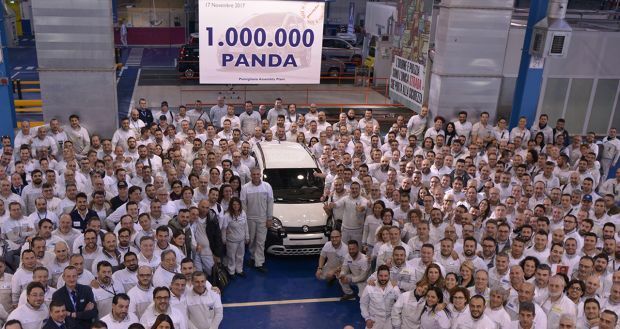 Turin, 17 November 2017 – The Fiat Panda, undisputed number one vehicle in Italy since 2012 as well as the European best seller in its class since 2016, has produced its one-millionth car at the G. Vico Pomigliano d'Arco plant in Italy, near Naples. This state-of-the-art factory has also won various awards over the years, since it was totally refurbished to make the Fiat Panda in 2011, with the first being a Silver award in the World Class Manufacturing certification programme and their most recent which was the Lean and Green Management Award in 2014 - a testament to the progress made in optimising all "resources" needed to make cars. The Fiat Panda is a City Cross 1.2 69 HP and has a white exterior accompanied by an off-road look designed to shake things up and add new adventures to urban lifestyles and will be sold in Italy. Since the launch of the Fiat Panda in 1980 it has stood out from the crowd with its three different personalities which makes it a functional city car, a compact 4WD off-roader and a fashionable urban crossover with outstanding off-road qualities. Through the years the Fiat Panda has had an excellent success rate in terms of sales and technological innovations and has made over 7.5 million cars to date. In 1983 the Panda 4x4 was the first all-wheel drive city car, in 1986 it was the first of its size to have a diesel engine and in 2004 the Panda was the first city car to reach the Mount Everest base camp at 5200 meters above sea level as well as being the first car in its category to be named “Car of the Year”. In 2006 the Fiat Panda became the first mass produced methane-fuelled city car and since its launch it has been the top selling methane-fuelled car in Italy and since 2007 in Europe. A new record was hit when the 300,000 methane-fuelled unit milestone was reached last February. The Panda GNC is also biomethane compatible. Copyright © 2019. William Simpson Cars (Pty) Ltd.